Having lived in Bhopal for sixteen years of my life, 3rd December had always been a day which was very important to the whole city. When I was young, it was just another holiday from school but as I grew up, I actually came to understand the essence of the day itself. My dad and my grandfather would tell me their stories of when the incident occurred and I would always wonder how it would have been like for the people who did not have any place or means to escape. I visited the village near the factory and the old age home where a lot of the survivors resided with their families and it was almost shocking to see their living conditions along with their sufferings. Even though this incident occurred 30 years ago, the wounds of the tragedy are still fresh in the mind's of the victims. In the early morning hours, one of the worst industrial disasters in history began when a pesticide plant located in the densely populated region of Bhopal in central India leaked a highly toxic cloud of methyl isocyanate into the air. The leak was caused by a series of mechanical and human errors in the pesticide producing plant, operated by the Union Carbide Corporation, a U.S.-based multinational. 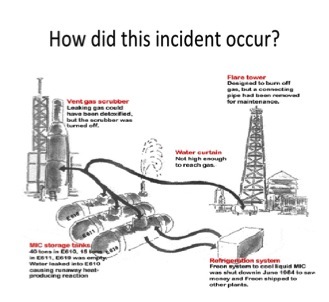 For a full hour, the plant's personnel and safety equipment failed to detect the massive leak, and when an alarm was finally sounded most of the harm had already been done. To make matters worse, local health officials had not been educated on the toxicity of the chemicals used at the Union Carbide plant and therefore there were no emergency procedures in place to protect Bhopal's citizens in the event of a chemical leak. If the victims had simply placed a wet towel over their face, most would have escaped serious injury. with their lives are the unlucky ones ; the lucky ones are those who died that night." The disaster hampered the economic well-being of the city and polluted the environment severely. People were left unemployed due to their injuries and diseases and were unable to earn a living for the rest of their lives. Contamination levels in soil and water samples at the plant were more than 10 times higher than in surrounding areas, indicating that the plant was the source of the contamination. Mercury and lead contamination have even found their way into samples of breast milk. The Indian government sued Union Carbide in a civil case and settled in 1989 for $470 million. Because of the great number of individuals affected by the disaster, most Bhopal victims received just $550, which could not pay for the chronic lung ailments, eye problems, psychiatric disorders, and other common illnesses they developed. The average compensation for deaths resulting from the disaster was $1,300. However, all criminal charges on Union Carbide were dropped, the worst being that nobody has been sent to jail as yet.